Aloha! My name it Malia and I was born and raised on the Big Island of Hawaii. I recently relocated to Seattle a couple of months ago after the lava flows earthquakes had damaged my home. I miss Hawaii but Seattle is quickly becoming part of my heart, I’m loving it here, almost as much as I love animals. From a very young age I knew that I needed to have animals in my life. I started by catching small reptiles keeping them alive in my room, not telling mom of course! I went on to having rabbits, guinea pigs, ducks, geese, chickens, a goat, and of course a number of dogs and kitties. I’m happiest when I’m around animals. I would visit the humane society once a week to pet and play with the animals there, I called it my “puppy time”. I have a very calm demeanor and I love caring for all animals. 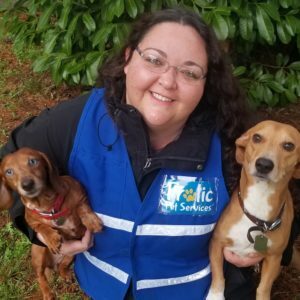 I look forward to meeting and caring for your furry family members! Mahalo for choosing Frolic!